220 volt, 4 batteries charged by: engine, shore power, generator Generator has had recent full overhaul. Crews berth for'd has A/C. All Cockpit winches are electric. I Pad at chart table. Electric bilge pumps have float switches, with the higher of the two connected to an alarm. A big volume family cruising yacht, with a good handicap for the occasional race ( she won the Raja Muda regatta 2005, 2006 and 2007 ). Neglected by her previous owner, the current owner purchased her as a project, with the intent of chartering her, work on her is nearly done, but his plans have changed and she is now offered for sale. Re caulking the decks is in progress and she will have a Bimini, Lazy Jacks and a Stack Pack in due course. She has two ensuite double cabins aft and a huge ensuite master cabin for'd, plus an air conditioned crews cabin all the way for'd, accessed from the deck, with 2 berths, heads and shower. All cockpit winches are electric, making sail handling a breeze. These boat details are subject to contract. Note: Offers on the asking price may be considered. 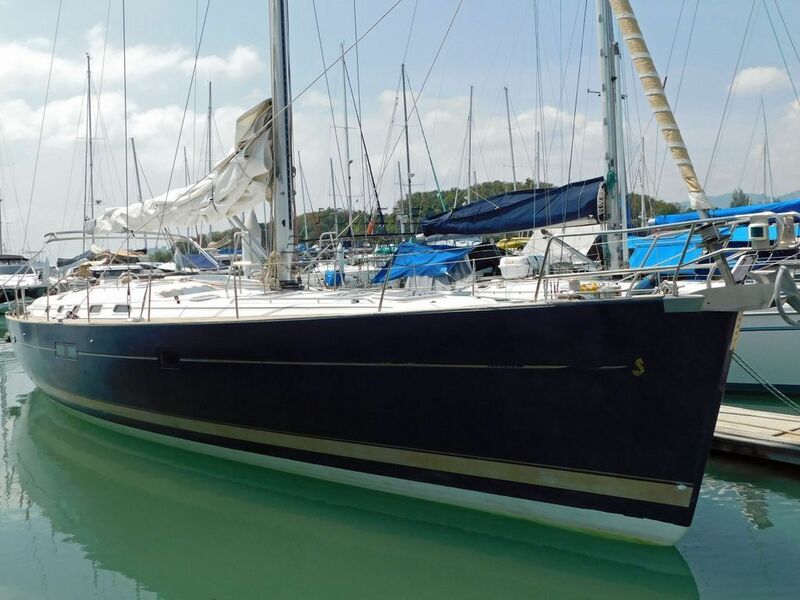 This Beneteau Oceanis 523 Clipper Fractional Sloop has been personally photographed and viewed by Alan Giles of Boatshed Phuket. Click here for contact details. The particulars herein are intended to give a fair description of the vessel but are not guaranteed as accurate. They shall not form part of any offer or contract for the sale of the vessel. The prospective purchaser is recommended to independently check the particulars. The vendor is not selling in the course of a business unless otherwise stated. Personal property is excluded from the sale of the vessel unless specifically included in the listing specifications above or in a Purchase Contract. Personal property may be equipment or gear not permanently attached to the vessel including but not limited to: artwork, entertainment equipment, fishing equipment, TV receivers, recreational equipment, kayaks, tools, and personal appliances. Photos that may incidentally depict owners' personal property do not convey that such items are included in the sale of the vessel unless specifically listed herein. Please note this comments section is public. Please do not post your personal details here. To enquire about purchasing this boat, please contact the broker directly at alangiles@boatshedphuket.com. Please read our commenting guidelines before posting.